On last night’s episode of Teen Mom 2, Jenelle Evans’ baby daddies are coming out of the woodwork. Nathan Griffith took her to court after child abuse allegations. Jace’s dad Andrew Lewis, showed up out of the blue. Is Andrew’s new interest genuine? Or does he just want attention? Jenelle definitely has 99 problems, and ALL of her baby daddies are one! Leah Messer’s daughter, Addie is going to kindergarten. Her twins are starting third grade. Ali is going to get a new aide at school to help her. Ali had not been eating at times in school because she was worried she would drop her tray. Hearing this, broke my heart, I am glad the school decided to give her assistance again. I think it is sad that this school isn’t prepared to help students with disabilities. Leah drops the twins off at Corey Simm’s house for visitation. They have a new custody schedule, but she still intends to show up to see them off for their first day of school. She meets Corey at the bus stop to see the kids off and brings Ali’s wheelchair. The driver discloses that he can’t take the wheelchair, because he doesn’t have a necessary piece. Leah is clearly frustrated, but decides to just drop it off at school herself. She also wants to speak to the principal, who assured her that she could use the wheelchair on the bus. I am so proud of Leah! In previous seasons, she would of have a complete meltdown and probably would not drive to the school, because it was an inconvenience. I am so happy she has matured and is healthy and mastered dealing with issues as they arise. 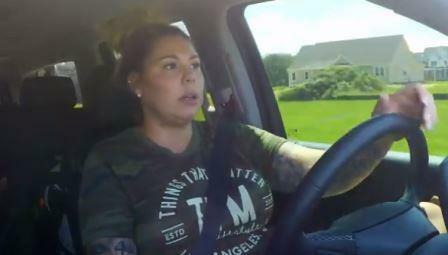 Chelsea Houska worries that Aubree’s dad, Adam Lind may not show up for visits with his daughter. She shares her frustration with her husband, Cole DeBoer. Poor Aubree doubts she will ever get a visitation with her dad. She knows he has no job to be able to pay the fee. Yes, according to Chelsea, this came out of Aubree’s own mouth. It has to be hard to know your dad isn’t $#! *, at such a young age. Chelsea’s father speaks with Aubree about her feelings on her dad not showing up to visitation. This is truly a sad situation. But I am happy she has strong visible men in her life, such as her grandfather and stepdad. At least Chelsea learned her lesson after falling for one deadbeat and moved on to a nice guy. Please take notes, Jenelle! A producer shares with Jenelle that Jace’s dad, Andrew has been contacting her to see his son. He wants Jenelle to bring Jace and her mother, Barbara Evans, to New York to meet Jace. Jenelle is torn because he hasn’t seen his son since he was a baby. She also doesn’t want Andrew to pop in and out of his life, like her father did when she was growing up. Although Jenelle has MANY issues, I don’t disagree with her take on the situation. Jace has been through a lot in his short life. I would hate for his dad to cause him any additional abandonment issues. On the other hand, if he is serious it would be good to have his dad in his life. I am side-eying the situation since he can’t even fly to his son’s state to see him. Jenelle and Barbara meet to discuss Andrew‘s desire to see his son. Barbara is concerned about any disruption this may cause to Jace’s life. They both agree to face time with Andrew, to lay everything on the table. Barbara takes the lead in the conversation and asks some of the hard questions. She wants to know why he has NEVER made any attempts to see his son since he was a baby. He seems to be full of excuses blaming Jenelle, for why he hasn’t seen his son. Barbara has always had primary custody of Jace and he could have easily reached out to her. The same way he contacted the MTV producers, he could have done that years ago as well. Barbara lets him know she would have to meet with him first, before making any decisions to move forward. Jenelle is concerned that Andrew may not be completely sober. Barbara suggests that if they start slowly and maybe meet for lunch every six months or so. Jenelle is still skeptical because she remembers him being abusive in their relationship and doesn’t trust him. In my opinion, they are more alike than she may believe. Sigh! Briana DeJesus invites Nova’s dad, Devoin Austin over to the house to talk about co-parenting. She feels like he needs to be more reliable and consistent with his daughter. Devoin admits his faults. He tells her that he is working she can always ask him for help. She decides to invite him to her daughter Stella’s birthday party. I thought his acceptance of the invitation was mature since it’s not his daughter and he doesn’t have a relationship with Briana. Briana meets with a friend and reveals that she has talked to Stella’s dad, Louis Manzano and he will be coming to the party. Sadly, in order to get him to come, she had to agree to pay for it. I understand people falling on hard times, but I would not bribe him to do what is right for his daughter. It will only enable him to never figure out ways on his own, to be in his daughter’s life. Briana sends him a text with the “rules” for his visit. Apparently, he must help plan and execute the party and he cannot leave early. Good luck, girl. She has a large family and I’m sure she would have a great time, despite him not being in attendance. Briana and her family rent a house for Stella’s birthday party. Her sister, Brittany DeJesus reveals that she saw a flyer on social media that he has planned a DJ gig while he is in town. Her mom and sister are furious that he is not helping or prioritizing his daughter. This is exactly why; I would not have paid for him to come. If he didn’t figure out a way to be there for his daughter, he is clearly isn’t ready to put his child first. Hopefully, young women see this show and realize they should be very mindful of who they procreate with. Everyone isn’t a good candidate to be a parent. Louis never showed up to help set up for the party. He does arrive before the party and looks completely out of place and uncomfortable. Briana doesn’t want to bring up the issues with Louis, because it’s not worth it. As if things aren’t awkward enough, Nova’s dad Devoin shows up. At least, he brought a gift, I don’t know if it was edited out, but I didn’t see Stella’s dad bring anything but an attitude. Kailyn Lowry drops her oldest sons off to visit Javi Marroquin at his house. I think it’s great he still maintains his role as a father figure in Isaac’s life. I think its super weird; Kailyn would drop two of her kids off at his house, but still refuses to meet his live-in girlfriend. Javi and his pregnant girlfriend, Lauren Comeau discuss the co-parenting relationship with Kailyn. They both claim to be happy that Javi still has a relationship with Isaac. Lauren is disappointed they didn’t talk at the soccer game, but she is willing to accept whatever Kailyn is comfortable with at this point. I hope Lauren is really genuine and cares about these kids and won’t be revealed as an opportunist. I guess we will just have to see as the season progresses. TELL US – DO YOU THINK IT’S A GOOD IDEA FOR JACE TO MEET HIS DAD? DO YOU THINK BRIANA SHOULD HAVE PAID FOR STELLA’S DAD TO COME TO THEIR DAUGHTER’S PARTY? SHOULD KAILYN HAVE FORMALLY MET JAVI’S LIVE IN GIRLFRIEND BEFORE HAVING HER KIDS GO TO HIS HOUSE? WHAT DO YOU THINK ABOUT TEEN MOM 2 SEASON 9 SO FAR? WHICH TEEN MOM 2 CAST MEMBER IS THE BEST PARENT?